Skied for 2.5 hours in questionable light but kept low, no higher than 2400m, and it was ok. Snow good still. Snowing atm. Will wait and go up if it improves later. Lot of snow forecast for weekend. Thanks for these updates Claude! Really appreciated! @Claude B, How was the snow fall over the weekend? Tuesday to Thursday look fine with more snow forecast Thursday night and Friday. I arrive on Sat, selfishly hoping the snow arrives this week and then the sun comes out. Echo the statement above, thanks @Claude B, for the updates. Forecast says a big dump of snow and low freezing level on Friday. Might be a bit lively on changeover day? Most of the snow is forecast for Thursday night and Friday morning. I don't think Saturday will be a problem. The reports and forecast suggest great conditions for today and the next few. Any live update Claude? If its like this at all during the week of 4th - 11th when I'm out there I'll be super happy. @TheGingerPrince, Hoping for the same as I'm out there from the 9th! Praying for blue sky's as I think they've had enough snow! Looked better than it was. Lovely and sunny but strong winds high. Nothing open above Toura this morning, I had to come down at lunchtime not sure if anything opened later. The middle was nice Lower was either icy or closed because of ice after the rain and overnight freeze. Tomorrow and Thursday look better, sun but less wind. Lovely day yesterday, beautiful sunshine. But the glacier chair is currently out of action causing big queues at Jandri 2 to get to the glacier. I couldn't be bothered with that and played elsewhere where it was fairly quiet Vallons de Diable was lovely in the afternoon, softening in the sunshine, almost spring snow Forecast good today with cloud coming in later with snow tonight and all day tomorrow. Looks amazing!! Forecast suggest alot more snow over the next two weeks! Can it take any more?? Really windy today and sun lost out to the cloud about lunchtime. Was out a fair while but didn't ski that much tbh. Day off tomorrow, snowy day. @Claude B, Seems the forecast snow isn't going to be as bad as first thought for this weekend? Also, a bit of a random question, looking at a two week forecast, it suggest a sharp temperature drop from 1st onwards (-1c to -13c at town level) and even colder a week later (-19c on wed 8/2). Is there any "talk" of a cold snap coming in? Beautiful day yesterday and as it's Saturday quiet. Some more fresh snow to top things up Bottom of glacier chair still out of action, they had the cables down yesterday. Skiing this morning then geading to UK for a week. Looks as if start of week will be sunny with it turning colder with some snow later. @blacksheep, is that the jandri express from the town? I’ll be avoiding that by heading up on the village chair lift then taking the 2nd section further up. It’s the 2nd section. I think there’s a chair lift that also goes up but it’s not been running. @Claude B, Can I pick your brains regarding the demoiselles green run in L2A? On another thread, it was described as "suicidal" when skied late in the day as a run home down the mountain. Any truth in that statement? Can only assume its full of intermediates/advanced skiers clogging it up or hacking it down? I'm in L2A next week and we have 2 beginners in our party. We're staying (very) close to the Village chair lift and whole plan was to take demoiselles home so the beginners didn't have to download to finish the day. @roscoe er sorry that was me . Look it's not a black run. But it is a narrow zig zag path. Each leg of the zigzag is a couple of hundred metres long. The run overall is quite long (perhaps 30 piste markers?) Most of the beginners on it can only snowplow down it (not wide enough for them to link turns) or scrape down the inside, skis at 45 degrees to the slope. The opportunities to overtake are severely limited. As long as you leave enough time and you aren't tired it's absolutely manageable. It's not a pleasure, something to be endured at the end of the day IMHO. Mrs Spin (an experienced if cautious skiier) prefers to take a lift. It's quicker and at the end of the day when we had the children in tow when they are tired it's just not worth the hassle. The only caveat is that I have only ever been on it at Easter when the snow quality hasn't helped. It may be an absolute doddle in February. @Spin Doctor, +1 on Demoisselles (?sp). @Spin Doctor, Thanks Spin Doctor. With all the snow this winter, I'm hoping it will in a good condition next week. The fact that its long will be good for the beginners confidence. I was with them in Chamonix last winter and they didn't get much skiing in of the nursery slopes. So longer greens will help them. Part of the reason we chose L2A for this winter. I wouldn't bother with the demoiselles, ever. It's soul destroying to the experienced and beginners alike. Take the jandri blue, a more recent addition to the mountain, or download on the jandri lift. @moody_git, We're staying at the Turan hotel which is next to the Village chair lift and at the end of the demoiselles run. So I think it would be more soul destroying having to trek back up 200m, through the town with ski's from the the bottom of the Jandri blue. At least on the demoiselles we'll be skiing. Or is it really that bad? I'll probably give the Valentine black run a few goes but prefer to stay with our group. @Roscoe, it's not. It's a narrow green track yes but far less busy nowadays since the blue opened. The snow on it is great atm. You can actually take the Village chair back down from Crête. @Claude B, Thanks Claude. 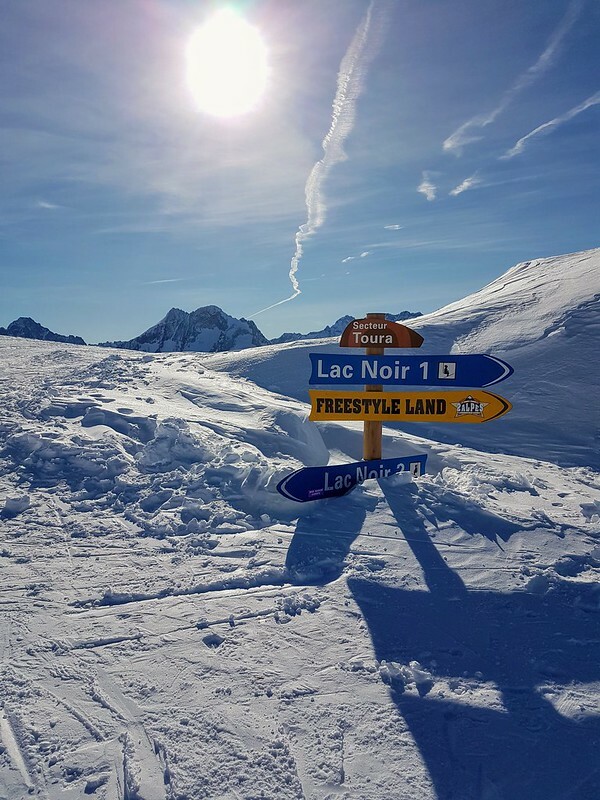 I'm sure it will be good for the beginners to experience skiing "home", especially if it gives them a chance to actually take in the view's and enjoy the mountain. Was looking at the forecast and 9 days out looks effing cold with freezing levels down to a couple of hundred metres. Is that unusual for early Feb. Only been to L2A at Easter time previously (4 weeks). Pack a few more layers and some inners? @Spin Doctor, there have been some pretty cold spells this winter, there usually are even last year. Looks like lots of snow over the next 24 hours and then flurries for the rest of the week! Proper cold as well!! What an awesome week for weather. Blue skies all but one day when we had a fresh dump so nice powder to ski. Yesterday was very cold up top, I made the mistake of not putting my down under my shell so did it as 3200! Amazing how quickly you lose heat! Last weeks skiing was perfect, 4 blue sky days followed by one big dump and a cold but blue sky day on the Friday! Great conditions, very lucky! We asked for advice earlier on in the thread regarding private instruction and we booked a 1:1 for my wife with Rod from BASS. Very very nice bloke who helped her massively over the limited 1.5 hours at the start of the week. About an hour later she got completely wiped out by an out of control border on the Jandri Blue down to resort and if it wasn't for the confidence building from Rod I can guarantee there wouldn't have been any more skiing that week for her. Thoroughly recommend his instruction for anyone with similar confidence problems! 3 days until i'll be in L2A!! Forecast looks ok/good Thur-Mon so fingers crossed that holds firm!